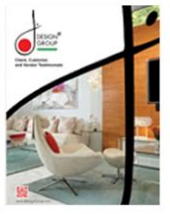 British supermodel Kate Moss took up interior design. She was invited to debut in the new role by Yoo, the studio of Philippe Starck and John Hitchcox, who are known with the collaborations with Marcel Wanders, Kelly Hoppen and Jade Jagger. Androgynous star of the ‘90s, muse of designers and fashion photographers, brawler and one of the highest paid models in the world (the fourth position in the Forbes ranking), Kate Moss has never denied herself a pleasure to experiment – she starred in movies, had been collaborating with Topshop for 5 years, designed jewelry and a celebrated 25 years in the fashion industry by releasing champagne glasses in the form of her left breast. 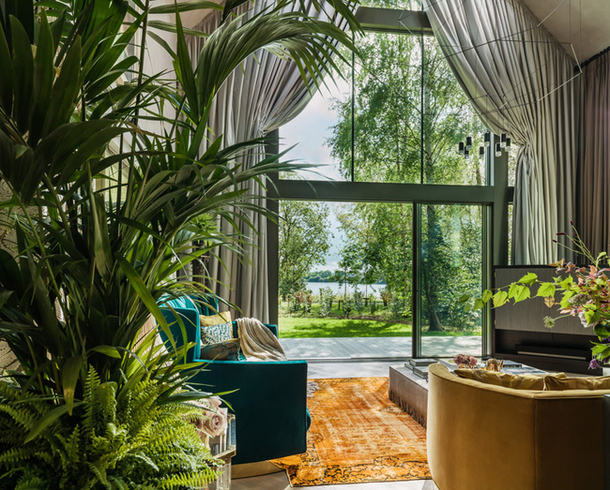 Yoo has been working for several years on a large project The Lakes – on 260 hectares of land among the hills, forests and lakes of Cotswolds, in one and half hour’s ride from London, the studio builds luxurious cottages with the interior that some star has designed. Kate Moss and John Hitchcox befriended owing to love of rural life and English pubs, and because of his advice the model decided to try herself as an interior designer. The stone house has five bedrooms, large windows, double-height living room with kitchen and dining room, fireplace, outdoor swimming pool and 4000 square meters of protected forest around – it will become the property of the buyer of The Barnhouse. 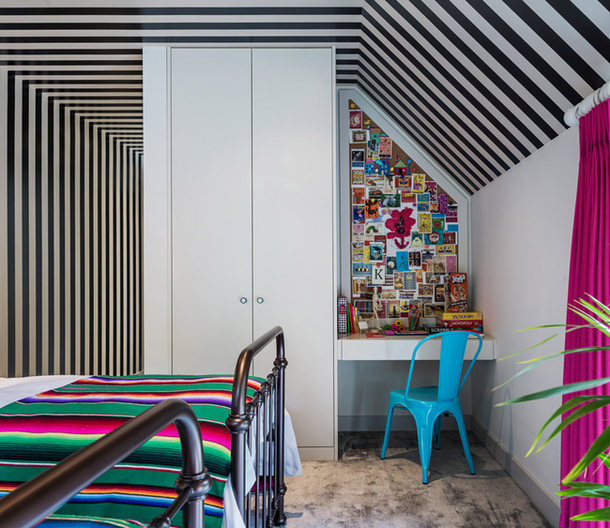 Inside there’s a mix of retro and glamour, a lot of bright velvet and shiny chrome, frayed carpets and contemporary art – works of Damien Hirst, Dinos Chapman and Allen Jones, a light installation by Arik Levy and wallpapers by the fashionable British House of Hackney. Kate Moss covered the bedroom of the future owners of the house with plush, light gray as birches outside, put mirrored furniture and her images. In the guest room there are striped wallpapers, bright fuchsia curtains, Peruvian blankets and some more pictures of the top model. The atmosphere of family comfort in the kitchen is created by indigo cupboards, natural wood, concrete island and a bit old-fashioned worn copper. A large dining table with a massive benches for the Barnhouse was carved by David Haddock, а furniture maker, who once built a large dressing room in the London house of Kate Moss. He invented and assembled the bed with a mirror frame for the master bedroom. 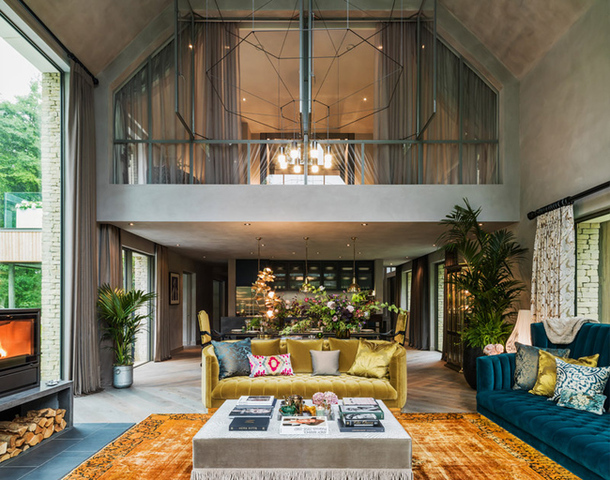 The whole team was satisfied with the result of this work – Kate Moss has tried her hand at a new field, and the studio is going to realize 2.5 million pounds for the house.